Used for a single speed conversion onto a six speed DMR (shimano compatible) hub. There were enough included size options to make it work just fine. I've tried other conversion kits, and this one was by far the best. It fit precisely over the hub with none of the slop of the other kits. The instructions make the set-up seem somewhat daunting, but if you are reasonably mechanically inclined, you should be able to install this kit just by eyeing the chainline. I've put in about 40 miles on the trails with this kit and no problems! This product when combined with the Surly SS cogs makes the conversion to SS almost idiot proof. Overall, I highly recommend this product when converting to SS, solid design, easy to set up, and rides like a dream. For spacers, they are pricey, but they are also very well built and to me they were worth it. I can rely on them which is what counts. The set includes many sizes, so finding a good fit was easy. Great rings for spacing out a single speed cog. 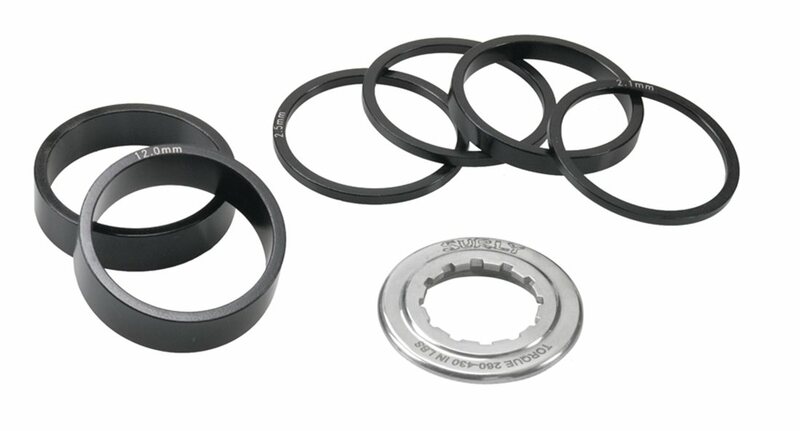 The locking ring also has a larger flange to contact the rings better. Where the Sun doth sun from time to time. Good quality space kit,lots of spacing options, looks good too. The perfect array of sizes fine tune the chain line and look good doing it! Great kit. Spacers are well machined and the finish is great. The lock ring seems pretty heavy duty so no fears of it failing. This is my second kit and the first has been flawless for many years so far. Only reason I gave it 4/5 is price. It is a little pricey for what you get really. Assuming you buy a Surly cog to go with this kit, and read the instructions, you will have no issue converting to single speed. Other single speed cogs have alternate widths; depending on what you buy, you may not have the correct number/size spacers to properly fill the freehub. This will result in too much or too little thread "bite" into the hub (your cog will be loose, or the end-cap will have partial-thread engagement). I purchased a niner-cog with this set, and had to fish around in my parts bin to find alternate spacers that would allow proper thread "bite". Read the instructions, and stick with a Surly cog, and this will work great. Will these spacers fit an XD compatible hub? No, this will only work with the standard shimano style freehub. I'm not sure if there is any good way to go SS with an xd driver. Nope, I have never seen an XD driver SS speed set up. You'll likely have to convert your free hub to Shimano. No, shimano Free hub only.